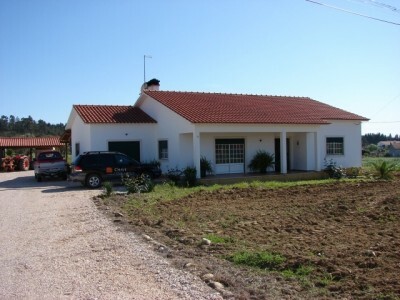 A two bedroom house for sale in São Pedro near the Knight Templars town of Tomar in Central Portugal. The property has 170 square metres of construction and is set on a plot of 5,000 square metres of flat land. The property, which is set over one floor, is connected to mains water and electricity. The house has a covered terrace to the front as well as one to the rear. To the rear of the house there is a opened sided car port, which has a wooden roof. The house is set on a plot measuring 5,000 square metres, which is all relatively flat. There is a gravel driveway and gravel patio area to the rear of the house as well as a tiled dining area and barbecue. There is a child’s swing set at the rear of the property. The house is fully double glazed and has integral shutters. The main entrance to the house leads into a hallway. This hallway has a tiled floor and partially tiled walls. The tiles to the walls are traditional-style hand painted Azeulejos. The living room, which is double aspect, also has a tiled floor. The living room has a corner fireplace with stone surround. There is a set of patio doors, which leads out to the covered terrace to the front of the house. There is a spacious kitchen diner, which can be accessed from either the hallway or via the living room through a set of double, part glazed wooden doors. The kitchen has a selection of fitted, wooden base and eye level units. The work surfaces are granite and the oven and gas hob are integrated. There is an exterior access door off the kitchen, which leads out to a covered terrace at the rear of the house. There are two double bedrooms, both of which have tiled floors. One of the bedrooms has built in wooden wardrobes. There is a family sized bathroom, which is fully tiled. The bathroom has a bath with a shower above as well as a pedestal sink, toilet and bidet. The house is located on the edge of the village of São Pedro, which has several cafe bars, a pharmacy, local council office, school and church. The historic town of Tomar, which is home to the UNESCO listed Knight Templars Convento do Cristo, is only six kilometres from Sao Pedro and has a choice of supermarkets, cafe bars, shops, restaurants, hospital, train station, bus station and university.